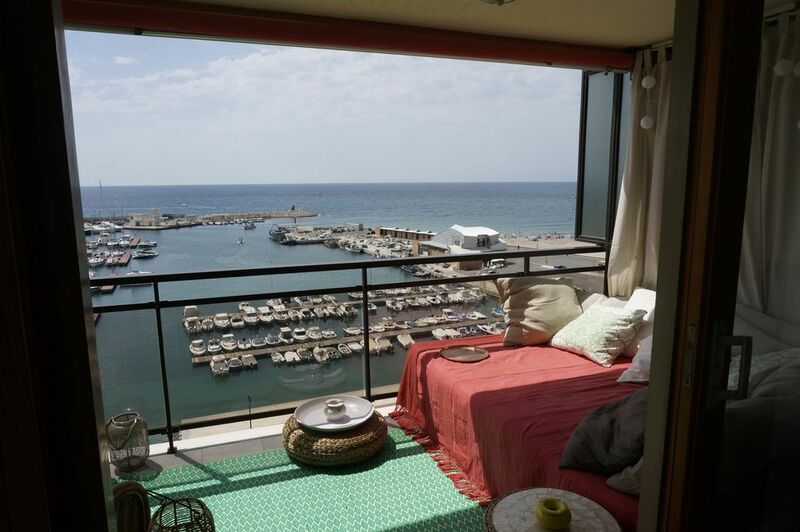 Spacious corner apartment and very bright, large terrace overlooking the sea and the marina (1st line). 95 m2 including 35 m2 terrace. Each room has access to the side terrace. Kitchen, fully equipped, open to the living room and bay window. direct access to the beach and downtown with many restaurants, bars and shops. The owner of this apartment is lovely, and met our needs with flexibility so that we could check in earlier/check out later. The apartment block has a lift and is easily accessible from the beach. Inside the apartment is clean and spacious, with a relaxed lounge area and a french boutique feel. The bathroom is large, with an enormous walk in shower which was wonderful. The kitchen included all the amenities you could want; microwave, dishwasher, washing machine and fridge/freezer. There are two bedrooms, one a double and one a twin, both with built in wardrobes. There is air con throughout, which cool you down in no time. You just have to empty the plastic bottles on the balcony regularly, which the pipes from the air con filter into. The balcony is the biggest selling point. We spent a lot of time relaxing on the outside day bed, eating at the table, or playing cards, all amongst the idyllic surroundings of the harbour and beachfront of El Campello. It was lovely watching the moon rising, particularly with it being the red moon! We enjoyed our stay here so much that I’m sure we will return in the not so distant future. Thanks to francoise for providing a superb location for our holiday.